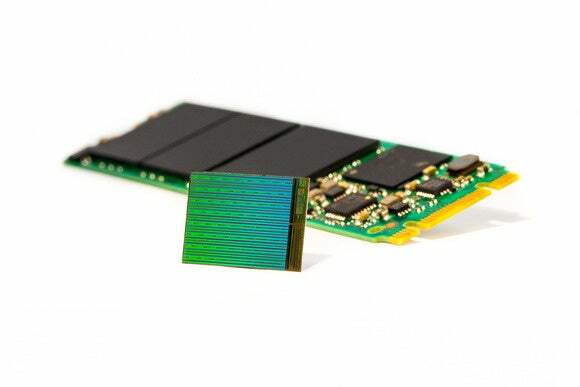 Standard consumer SSDs will increase up to an astounding 10TB of storage, thanks to a new type of 3D NAND flash memory that Intel and Micron introduced Thursday morning. The two companies, longtime joint partners in NAND flash development, said the breakthrough isn’t to make larger flash chips, but thicker ones. Much like Manhattan, when you’re out of space, the only way to go is up. Executives at the two companies said that by stacking the NAND they can greatly increase the capacity. The new 3D NAND technology stacks flash cells vertically in 32 layers to achieve a 256Gbit multilevel cell (MLC) and 384Gbit triple-level cell (TLC) die that fit within a standard package. Both say this approach will yield greater efficiency and lower the cost too. Pack a bunch of those together, and the end result is a tripling of capacity over today’s drives, at least initially. For a standard 2.5-inch SATA drive that means up to 10TB of space; for the M.2 drive type used by most laptops, the 3D NAND will boost capacities up to 3.5GB. 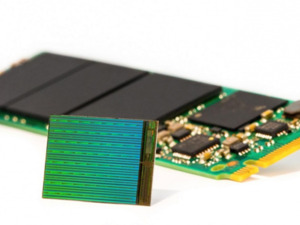 "This 3D NAND technology has the potential to create fundamental market shifts," said Brian Shirley, Vice President of Memory Technology and Solutions at Micron Technology, in a statement. "The depth of the impact that flash has had to date—from smartphones to flash-optimized supercomputing—is really just scratching the surface of what's possible." 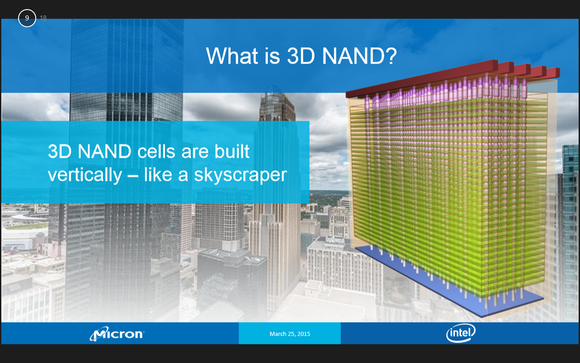 You can see from this slide how the 3D NAND builds up rather than out. The chips are already sampling at both companies, and Intel said it expects to offer products for sale using the 3D chips in the later half of this year. But how long will the chips last before they fail? That information wasn’t disclosed. Intel did say it expects to offer products using the new NAND chips this year. Why this matters: SSDs have drastically impacted computing—but even as prices have dropped, the capacities still lag far behind those of traditional magnetic hard drives. This 3D NAND announcement puts SSDs on a density increase that could very well see it eclipsing hard drives, at least for most people’s needs.